I beaded these flowers almost 22 years back for designing on a sari.The work involves patience.Again now i started these beading works. i will try to post my tutorial on this flower making. To make this flower one needs patience as the beads are so small in size. actually i clicked this image for a close-up view . 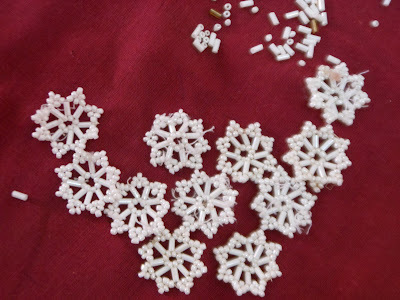 i beaded these to embellish on my sari . but before doing so, i attached these on my daughter's top. I then changed my mind and removed them from the top and snapped this photo at that very moment. That's why you can see threads coming out of the flowers.